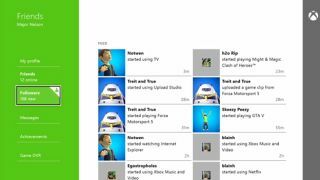 Microsoft has gone big on social features for its new Xbox One console, and Monday gamers got their first in-depth look at the Friends application that'll debut on the hotly-anticipated device next month. Xbox Live's Major Nelson (aka Larry Hyrb) explained how the new gaming-themed social network will work in a full video walk-through. Judging by the evidence below, the outlook seems pretty rosy. Xbox One owners will be able to make up to 1,000 Friends (Xbox 360 friends are automatically transferred over) while the number of Followers they can accumulate is unlimited. Users will also have a Profile showcasing their vital stats (reputation score, friends, followers, avatar, etc.) and also an Activity Feed showing what friends are doing in real-time, just like traditional social networks. If a gamer is browsing the feed and notices a pal has just started up a multiplayer game of Forza 5 online, for instance, they'll be able to jump in on the action. Checking out another gamer's profile will enable the user to see their activities, achievements and recently shared video uploads. They can also follow pro gamers or celebrities and measure their own performance against rivals. Hyrb thinks the Friends app will be a convenient way for people to meet using Xbox Live, but assured that users can keep their profile private if they so desire. He wrote: "So what's the difference between a friend and a follower? They are all considered your friends on Xbox One, but the levels of privacy between the two are different. You can follow anyone you want and it's completely up to them if they follow you back. You can also decide what information your followers can see about you. "When you and another gamer mutually follow each other, it creates a more interactive relationship that unlocks the ability for you both to see information like when each other are online, what achievements you earn in real time and what you're up to on Xbox One." Augmented reality just got another contender.